With five weeks remaining in the NFL season, the contenders vying for division titles have shrunk rapidly. In two divisions the, race for first place is already over according to the oddsmakers, who have junked NFL gambling odds for the AFC East and NFC South. Next likely to hit the scrapheap are divisional odds for the NFC West. 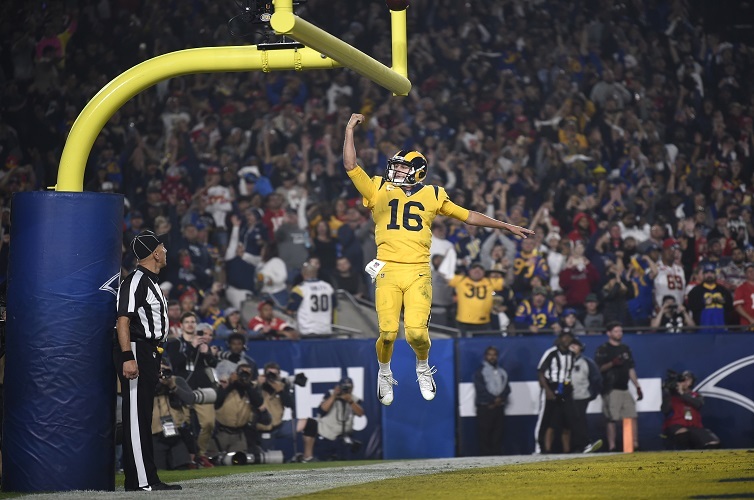 The Los Angeles Rams at 10-1 on the season are a -100000 favorite on the NFL gambling odds to win the division. If you’re looking to win a few pennies, that’s a bet for you. The Seattle Seahawks at +5000 still mathematically have a shot at the division if the Rams completely falter down the stretch, but we’re not holding our breath. Looking at divisional races that could still go one way or another let’s start with the NFC East. Tied atop the division at 6-5 are the Dallas Cowboys and Washington Redskins. However, the Cowboys are the division favorites at -165 followed by the Philadelphia Eagles at +240. The Redskins come in next at +450, mostly because they have lost three of their last four games and are without starting quarterback Alex Smith for the rest of the season. The deciding factor in the NFC East race could be a Week 14 matchup between the Cowboys and the Eagles in Dallas. In the NFC North, the division is the Chicago Bears’ to lose. The Bears sit atop the division at 8-3, and they’re also favorites on the NFC North odds at -425. Minnesota is next at +255, while the Green Bay Packers remain barely alive in the race at +10000. If the Vikings can make up some ground on Chicago in the next few weeks, it could set up a winner-take-all showdown between the two teams in Week 17. The Pittsburgh Steelers lead the AFC North division at 7-3-1 and are favorites at -350 on the NFL gambling lines. The Baltimore Ravens are the only other team in the division over .500 and follow the Steelers at +275. Surprisingly, the Steelers have only one divisional game left this season. However, they do have three tough matchups against the Los Angeles Chargers, New England Patriots and New Orleans Saints. In the AFC South, the Houston Texans have won eight straight to sit atop the division at 8-3 and they’re the division favorites at -500. The Indianapolis Colts are +320 underdogs, while the Tennessee Titans are +3000 longshots to take the South. Houston faces Indianapolis in Week 14 and a win could lock up the division for the Texans. Finally, in the AFC West, the Kansas City Chiefs are -900 favorites. This is despite having only a one-game lead on the Chargers. The Chargers come in behind them at +520. The Chiefs have been gifted two games against the Oakland Raiders the rest of the way. Nevertheless, it could all come down to the Chiefs-Chargers matchup in Week 15.